The game is aptly named – it is meditative and calming. There is no beeping timer, no flashing lights, just a simple board where you may strive to focus and improve your recognition of pairs of complementary numbers. Players are presented with a screen containing 48 squares – each of which is marked with a single digit number (1 through 9). 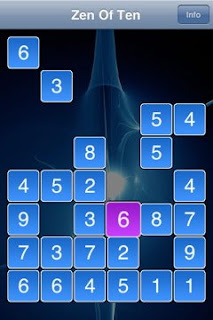 The goal is to clear the screen by selecting pairs of squares that add to 10. My first try (with some fiddling around to test the interface) took more than two minutes, My best time so far is just under 33 seconds – and I will be back to improve. There is one setting adjustment – allowing you to switch the game play from having to simultaneously tapping on two numbers that add up to 10 – to a single touch game where you tap on one number and then tap on the complementary number. I prefer this single-touch mode because it removes some of the frustration and distraction associated with trying to touch two objects on the screen at once. If the touch process was perfect, and never missed, then perhaps the simultaneous mode would be more satisfying, but even then I think I would prefer the sequential selection of numbers because it allows the player to play in a way that is more consistent with their thoughts and reduces the amount of time that the screen is obscured. I chose to review this game first because it embodies many of the ideals that I am looking for in games that might be used in the classroom or at home to help children learn. It is calm but engaging, it is simple but challenging, and it has the potential to help children to a useful concept, fact or skill in mathematics. For Zen of Ten, the learning objective it helps children to master is the automatic recognition of complementary number pairs. To benefit from this game a child should already have a rational number sense (able to count 1:1 with objects, to recognize that the last number counted represents the number of objects in a set, can tell you one more than a number and one less than a number, can tell which number is greater, etc.). Similarly, the child should already be familiar with numerals, the operation of addition and be able to recognize by sight the number of fingers held up in two hands. 1. If the child has not yet mastered relating groups of objects to numerals or adding groups of objects by counting on they are not ready. They need to focus on counting and adding concretely first (I’ll be looking to review an app to support this soon). Get out some chips, beans, candies, etc. and then move toward playing games involving dot dice, dominos etc. 2. Ask the child to explain what number must be added to 8 to get to 10 and redirect to easier questions if this is too difficult. Work through all of the pairs of numbers. 3. If they struggle ‘seeing’ complementary numbers – draw a ten-frame on a sheet of paper (two rows of 5 boxes) and use some convenient objects as markers. Place 6 objects – one to a box – in the ten-fram and ask the child to explain what they see. If they don’t see 6 and 4 and 10, prompt them with some guiding questions until they do – repeat the process – until they get the idea. 4. Work with the child to create a visual support aid – with 5 different ten frames showing 5+5, 6+4, 7+3, 8+2, and 9+1 (and their commutative analogs – e.g., 4+6). Let them use it for support once or twice as they are playing the game. Help them to recreate it next time if they seem to need or want it later – perhaps by drawing the ten frames for them and prompting them to represent the complementary pairs. A nice little program that focuses on only one little skill (automatically recognizing complementary numbers), but that skill is a really useful skill to have. As a testament to my perception of the value of this app I plan to keep Zen of Ten on my iPod for future play and tutoring support. I've set up this blog as a place to engage with parents and teachers who are interested in math related apps for the iPod Touch or iPhone. The iPod Touch seems to be an excellent platform for 'apps' that support discovery, creativity, consolidation and practice in mathematics (for both parents and kids). I was hooked as soon as I downloaded and played with my first App. The iPod Touch seems to be an almost perfect 'portable learning device' for supporting instant parent-child shared learning experiences (the 5 minute tutoring session, or the 2 minute exploration, or even the 30 second discovery). I frequently search through the app store for new applications that have some potential to motivate me or my child or both of us to capture a moment and engage in some mathematically significant activity. Here I will present my 'finds'. The applications that I have discovered by scrounging through the good, bad and interesting apps in Apple's AppStore. To be clear, I am not looking for apps in only in the education category, I am looking for apps that in my judgement may have some educational merit. These may be found in games, education, utilities, productivity, lifestyle, health&fitness, etc. For each app that I ultimately download and use I will present a summary description, a screen capture or two, my reflections on the potential uses of the app to support learning and three 'Tap Tap Math' ratings. These ratings will be for usability, educational potential and entertainment value - with one as the minimum number of taps and five as the maximum. I will leave the comments open to the public and encourage you to participate in this discussion. Please let me know about games or other apps that you think might also support learning in mathematics.